It’s the most ideal “ LEAK TEST” instrument for checking Blister Packs, Strips and Pouches. It makes the conventional dessicator with a huge vacuum pump, obsolete. 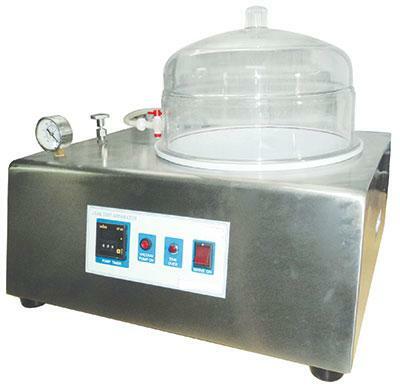 The Vacuum Pump ensure that a high level of vacuum is created in the shortest possible time. And the die-pressed, polycarbonate vacuum dessicator sustains the vacuum for a long time. A vacuum gauge is provided to indicate the vacuum level. This is connected to the isolation valve which helps disconnect the source, thereby avoiding the need for running the vacuum pump continuously. While it’s amazing compactness saves valuable space in process laboratories and timer helps the operator attend to other chores at a time.